Sunday was the last day for Gov. Jerry Brown to decide whether bills passed by the Legislature this year will become law. Here are the high profile bills that Brown took final action on this weekend. The measure from state Sen. Scott Wiener (D-San Francisco) mirrors Obama-era federal protections that were repealed by the FCC under the Trump administration. The state rules will prohibit internet providers from blocking, speeding up or slowing down internet traffic and charging more for faster service, among other things. Within hours, the federal government announced that it was suing California over the new law. In the wake of the #MeToo movement, the Legislature passed several bills related to sexual harassment and women in the workplace. Brown on Sunday signed two of those bills into law. SB 820 bans confidentiality agreements and secret settlements in cases involving sexual harassment or discrimination, and SB 826 requires corporations based in California to have women on their board of directors. SB 826 has raised significant opposition and legal questions, but in a rare signing message, Brown wrote that the bill has "potential flaws that indeed may prove fatal to its ultimate implementation. Nevertheless, recent events in Washington D.C.--and beyond--make it crystal clear that many are not getting the message." The message seems likely in response to the nomination hearings of Judge Brett Kavanaugh, which have furthered the nationwide conversation on sexual assault after Dr. Christine Blasey Ford, a Bay Area professor, testified that Kavanaugh sexually assaulted her when they were in high school. The U.S. Senate Judiciary Committee, which voted to send Kavanaugh's nomination to the full Senate, was copied on the message. SB 1421: This bill would require records connected to police misconduct to be made available to the public. AB 748: This bill would require the release of police bodycam footage except in certain situations. AB 2923 will give BART greater power over housing decisions and allow the transit agency to set zoning standards and approve development on agency-owned property throughout the Bay Area. Under the measure, BART's own transit-oriented development guidelines would govern residential and mixed-used projects on property the agency currently owns within a half-mile of station entrances. Most of that property is used for parking. The bill would affect an estimated 250 acres in all. Brown vetoed AB 186, which would've allowed San Francisco to open the country's first supervised injection site for drug users. "Fundamentally, I do not believe that enabling illegal drug use in government sponsored injection centers — with no corresponding requirement that the user undergo treatment — will reduce drug addiction," Brown wrote in his veto message. He also noted that the federal government has already threatened to sue if the bill became law. "AB 186 is all carrot and no stick," Brown wrote in closing his message. "We have seen these sites work in cities in other countries, and we know they not only save lives, but they can save our city money by reducing costs for health care and emergency services," said San Francisco Mayor London Breed, who supported the bill, in a statement. "Despite this veto, we will still continue to work with our community partners on trying to come up with a solution to move this effort forward." 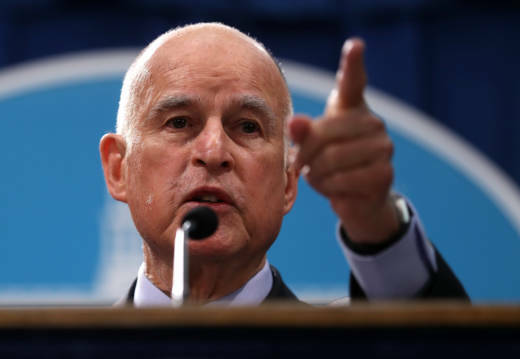 While Brown signed SB 820 and SB 826 into law on Sunday, he vetoed AB 3080, which prohibits the use of mandatory arbitration agreements as a condition of employment, saying in his veto message that it would "plainly violate federal law."